Normally I write about entire meals but there is one street vendor in one corner of Bangkok that sells a single item that is so good, that my mouth waters as I write this. The vendor, Raspal Singh, makes samosas, the deep fried Indian pastry filled with a potato mixture and served with a complementary sweet and sour sauce. Mr. Singh’s stall is nothing more than a single cart parked alongside a wall in a small soi (alley) immediately to the south of India Emporium, a small shopping center in Pahurat (Little India) on Chakrapet Road. This is not far from Bangkok’s Chinatown and the Old Siam shopping center. All day long he prepares batch after batch of the samosas (they also prepare tikki – which is the filling fried up without the pasty wrapper) and you can only get them to go. They’re so tasty, though, that eating them by the side of the road is perfectly acceptable. Why would you want to wait and let them get cold? 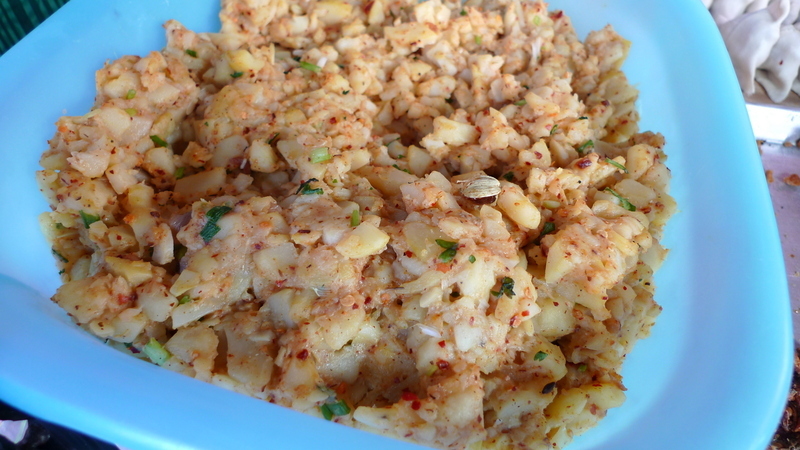 The filling is made of potatoes mixed with loads of spices. It is a great example of vegetarian food that has rich, satisfying flavors. The secret to any successful fried food is that the oil has to be fresh and at the proper temperature. Too hot and the outside burns before the inside cooks. Too cold and the whole thing becomes greasy. Mr. Singh is the master of the boiling oil-filled wok, turning out an endless stream of perfectly cooked, crispy but not greasy samosas. 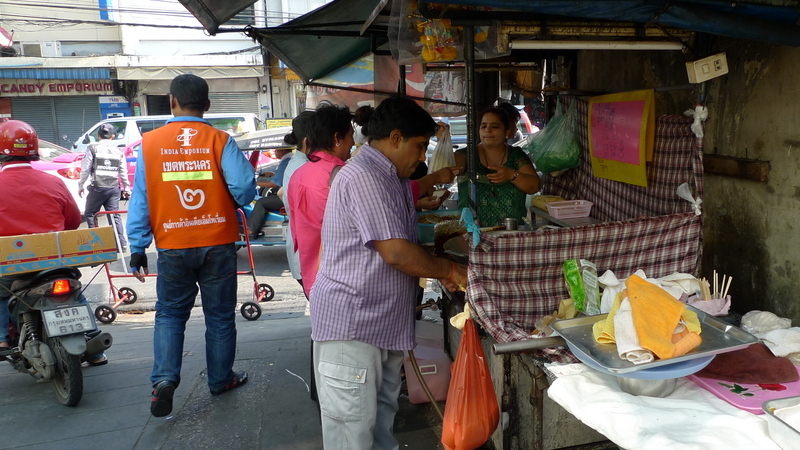 If you find yourself in the heart of old Bangkok, craving a snack that will satisfy but leave you eager to return, you should head down to Little India and seek out Mr. Singh’s samosas. Many thanks to Chawadee Nualkhair (www.bangkokglutton.com), author of Bangkok’s Top 50 Street Food Stalls, for leading me to this gem. This entry was posted in Uncategorized and tagged Bangkok, Chakrapet, Emporium, food, India, Little, Pahurat, Road, Samosa, Singh, Stall, street, vendor by christao408. Bookmark the permalink. Looks great! I’ve never heard of any place around here that had a “Little India”… I wonder if they’re common in the US, or if I’ve just missed them? It is not too difficult to find Indian food but it is quite a drive from me. It is worth the trip. I have to try these the next trip to Tampa. Now I want some Indian Food. They have an Indian grocery store that sells frozen ones to fry yourself. I just might do that. Thanks for the tip on the oil. 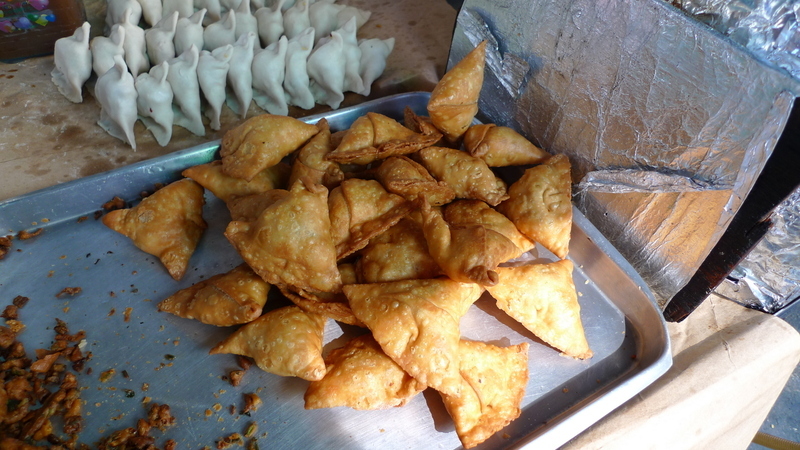 I love samosa and these look so delicious. I’m noting the place down for any future visit to Thailand. Thank you for the post! Just made some yesterday for snack. 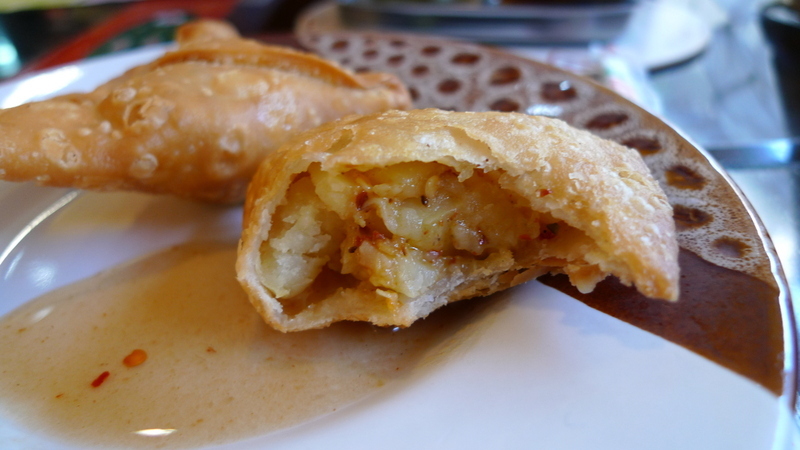 @Passionflwr86 – Meg, NY is full of Indian restaurants, and the area of Jackson Heights is nothing but India itself. 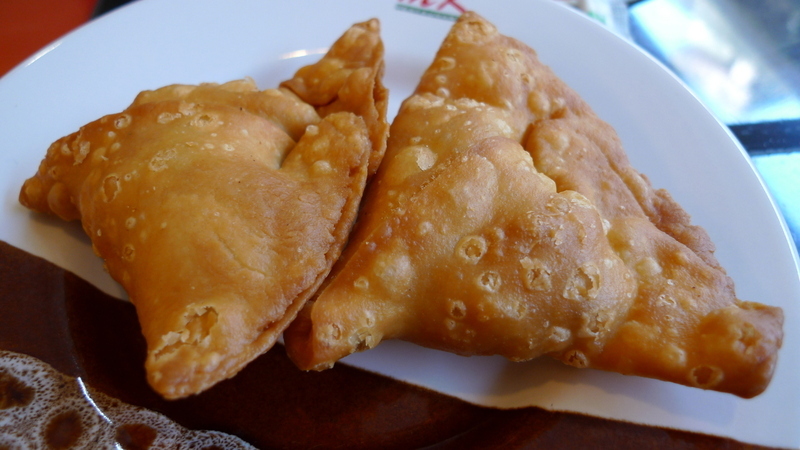 You can get these samosas in any of the indian restaurants. Oh yes! It is always a toss up when we got to Star of India – samosa or the stuffed naan… Sometimes we get lucky and they have them on the buffet. Sometimes. ahhhh looking at this already makes me hungry. Thanks for sharing!! @I_love_Burma – Simply put, I’d love to go try the ones in Burma just as a point of comparison! @Passionflwr86 – Lots of Indian communities exist, especially in larger cities. I grew up in the SF Bay Area and part of that region – Fremont and Newark, specifically – have large Indian, Pakistani, and Afghan communities. In fact, I believe I’ve read that it is actually the largest concentration of Pakistanis and Afghanis in the United States. Needless to say, lots of good food available! @Fatcat723 – I’ve never shied away from a road trip to have some good food. @CurryPuffy – Curry Puffy! LOL@kunhuo42 – Glad you enjoyed. @ZSA_MD – Were that I was in Quincy! @murisopsis – Just re-reading this entry, I’m getting hungry for a full-on Indian meal. I think I’ll fly to see Dr. Zakiah! LOL@radio03 – Yes, it does get one’s mouth watering, doesn’t it? Glad you enjoyed. I have them often. I love it! Mouth is watering… thanks for describing in detail how perfect the texture is, right before my bed time. I always get nervous about eating street food. It does look very good though.